My interest in runes began when my sister lent me The Book of English Magic. One of the topics it covers is the runes. It briefly describes their history, meanings, how to use them and how to make a set. My sister had access to wood and tools through her work, so she made me a set. I was interested in learning more about runes and how to use them, so I installed an app on my phone that popped up a notification each day describing the meaning and associations of a random rune. After a few weeks I had learnt the names, symbols and meanings of most of the runes, and I was ready to start using them. My friend gave me a book about runes for my birthday, which explained in more detail the history and meanings of the runes as well as how to use them. I started to do some readings for myself and some friends. 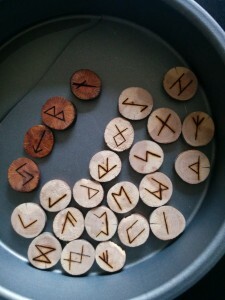 I liked working with the runes, but I fancied making a set myself. My sister in law bought me a pyrography pen for my birthday, and I had some old sticks I had collected on walks in the woods, so I had everything I needed to get started. 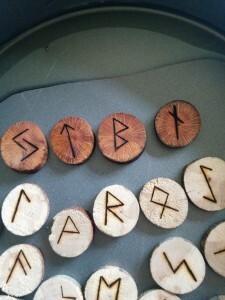 If you want to make your own runes, make sure your wood is completely dry before you start. My stick had been sitting in my house for about three years so it was definitely dry. 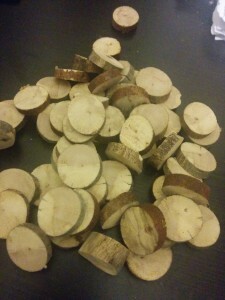 The first step was slicing one of my sticks into discs using a jigsaw. This was harder than I had thought it would be, since we don’t have a suitable work table or a clamp to hold the stick still. My chosen stick was twisty and crooked, it had probably been a root. This made it even more difficult to slice as it wouldn’t lie flat on our kitchen table. Holding the stick at various angles with one hand and the jigsaw in the other, I managed to slice it up without injuring anyone or damaging the table, which is probably a miracle in itself. I was left with a pile of 58 usable slices and a few extra gnarled or damaged pieces. I sanded the slices lightly, they were mostly pretty smooth but some had sharp or rough edges from the sawing. Then they were ready to burn. For the first set of runes, I chose tip with a fine point for the pyrography tool, I had previously used this tip for making plant labels and it had worked well for writing. The runes came out reasonably well, but the wood was a bit uneven in that some areas were softer than others across the same slice. This meant that some parts burnt really easily whereas others needed more time and pressure to achieve the same effect. Because of this, some of the rune symbols came out slightly wonky. For the second set, I chose a wedge shaped tip which allowed me to burn a straight line. Since rune symbols are all made up of straight lines, I hoped this would help reduce the wonkiness, but I was a bit worried about whether the lines would be even due to the softer areas burning faster. I needn’t have worried, the straight lines came out really well, and were much easier and quicker to burn than writing freehand with the pointy tip. For both sets of runes I used the elder futhark, a 24 rune alphabet, primarily because these are the runes described in my books. The process of burning the symbols into the discs was relatively simple and I enjoyed it. The main difficulty was holding the discs still without burning my fingers. I solved this issue by holding each disc between two chopsticks lying flat on the desk. This enabled me to keep my fingers well away from the hot tool and also allowed me to turn the disc while I was working on it. The other difficulty was the tool itself got incredibly hot, and by the time I had finished one set, it was too hot to hold any longer. This meant that I had to burn each set on different days. When I had finished burning the rune symbols, the last step was to protect the wood. I chose walnut oil for this as I wanted to use something natural that would show off the beauty of the wood. 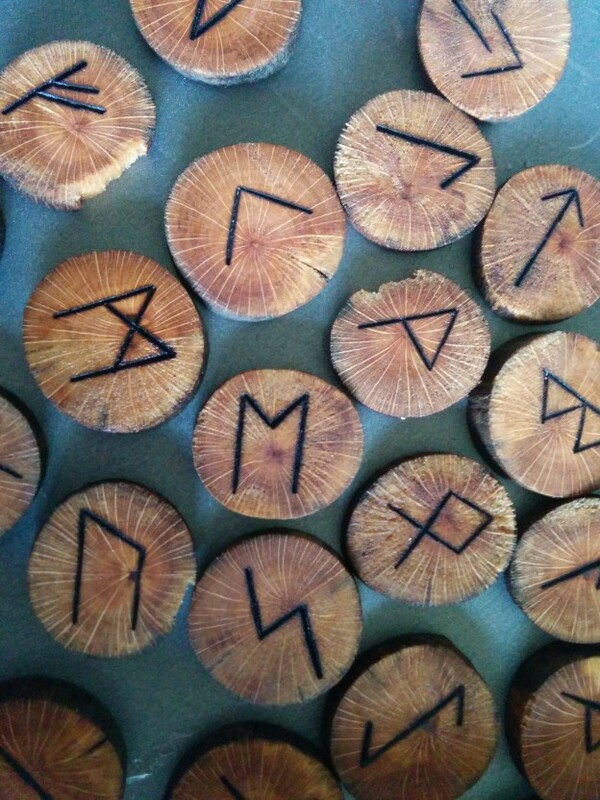 I used my fingers to rub the oil into the runes and left them to dry. The following pictures show the second set of runes made with the wedge shaped tip. The colour of the wood changed dramatically when I applied the walnut oil, and the pattern of the grain was highlighted. I really like the darker colour and the way it totally changes the character of the runes. The finished runes are just lovely, I’m really pleased with them. I enjoyed the process of making them, and I love that they are completely hand made from natural materials. I will be keeping this set for myself, and the first set I made is a gift for a friend. I hope she likes them as much as I do.